Innovative design and down to the smallest detail our Large Animal Jackets fulfill all the demands placed on today's investigators. A single jacket will typically incorporate many materials, special features and fabrication methods which combine to increase comfort for the subject, as well as ease of use for the handler. The models shown here are just a small selection from an extensive range which includes jackets for many other species. For more detailed information on available sizes and ordering codes for our jackets, click here. Extensive ranges of standard designs are always available. Custom designed jackets are undertaken. Anchoring patches to connect to tethering systems. Custom accessories such as for dermal applications. available with a range of accessories such as anchoring patches for tether systems and pockets for ambulatory experiments. 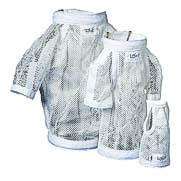 Designed primarily for beagles and hound-type dogs; sizes available for larger dogs. also in 3/4 or full length with or without rear-leg enclosures. available in 3/4 or full length with or without rear-leg enclosures. as well as specific farm or marketweight swine. All jackets may feature expandable panels made of spandex, designed to accommodate growth of the abdominal area and ensure both comfort and fit. For information on ordering swine jackets, please contact us. Jackets and vests for farm and other animals; We design and manufacture custom-made jackets and vests for any type of animal used in biomedical research. Please contact us for information regarding jacket specifications and features, ordering and prices. Accessories: We offer several accessories, including anchoring plates for tether end-plates, dermal application for all size jackets including rodent jackets and pockets in a range of sizes and fabrics. Other options are available on request.